I could give a flying flip that Joe Biden was using a stupid “Indian Accent” to make a point. What is annonying is the insufferable hypocrisy of the leftist progs. Remember the outrage and articles about the way Newt Gingrich sounded out “Juan” Williams name in the debate? Yeah, Oooooh he said it different so he must be racist right? To have a complaint thee guilty part must have mens rea, dis mens just be rea stoopid. Now, that eye dialect could be construed as being racist. *snork! * Walter’s got him by 80 IQ points. 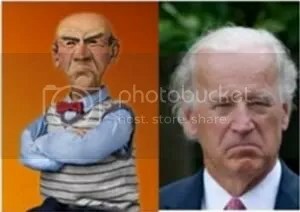 Even when Jeff Dunham’s not in the room! Don’t let Walter see this. I can pretty much guarantee he’s a conservative. Joe Biden is the poster boy for the media’s double-standard. Yet again I say that if Libs didn’t have double standards, they’d have no standards at all.